We know you love to rock a good ol’ fashioned pencil skirt whenever you can, but up until now, you’ve never had one that was quite this powerful. Because we tapped into the power of the women of DC COMICS to ensure this skirt is the one that’s going to make your day amazing. Part of our exclusive FUNwear line, this stylish pencil skirt is designed to coordinate with our women’s DC COMICS Vintage Blazer and works great on its own, too. In versatile black, this skirt hits below the knee and features a print interior lining along the waist and slit. 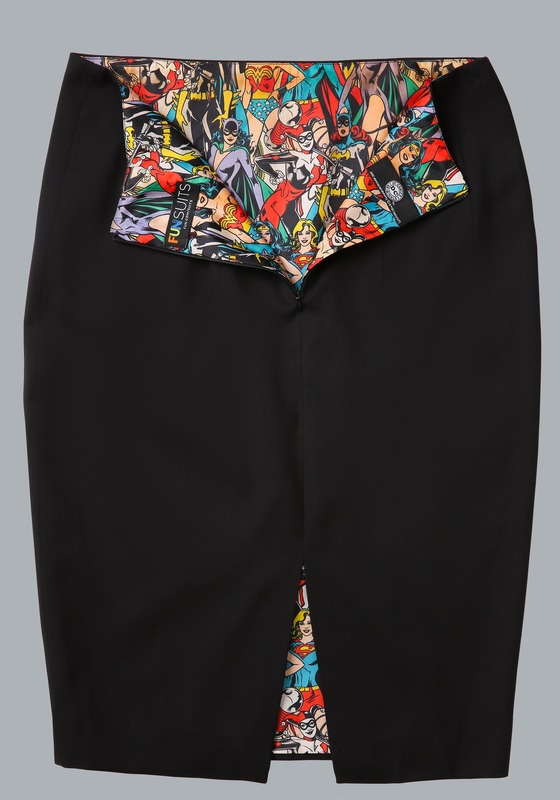 Use it to create a workwear ensemble that has a powerful yet subtle touch of Super Hero awesomeness. Slit at back center seam. Just received my skirt and it fits true to size! The quality is actually much better than I anticipated: this is an office-quality piece. The lining does not show except subtly with movement (in the kick-pleat). I also bought the pink Blazer and it is also a very good piece. The skirt is high-wasted and still comes down to cover my knee-caps (perfect length for me) I'm about 5'4" and 110# and the 2 fit perfectly. Can't wait to wear this! My (super) power suit :) may even wear it to future interviews! We hope you do wear it to future interviews, who would turn down a Superhero working for them?